The advantage of Afterburn is significantly increased thrust; the disadvantage, it’s very high fuel ($) consumption and inefficiency. This is often regarded as acceptable for the short periods during which it is typically used. With the Jets cooled in the hangar for the time being awaiting it’s second call to the runway that is the NHL, it seems like a good time to look at the potential opening day roster for season 2. Future Czech Olympian Ondrej Pavelec must improve his conditioning for him to continue with his development towards becoming an elite NHL net minder. By signing the recently turned 25 year old to a 5 year deal worth $19.5M the Winnipeg Jets believe the six foot three, 220lb Pavelec will develop into the franchise goaltender every championship team needs. Clearly ensconced as the number one option for Coach Claude Noel, Pavelec should benefit from a greater commitment to team defense and the continued progression of the teams young defenders. With a career save percentage of .907 and just 70 career wins, True North has seemingly taken a leap of faith in the kid from Kladno, Czech Republic. For those who witnessed firsthand the talents of Mr. Pavelec in 2011-12, his first season as the franchises starter, it is difficult to argue against his potential. A greater level of consistency and another season under the watchful eye of goalie coach Wade Flaherty will surely see ‘Pavs’ get career victory number 100. Playing a similar style to that of Nashville’s Pekka Rinne, Pavelec is very strong getting from post to post and shutting the door in a hurry. Exceptionally athletic for a big man his physique poses great challenges for shooters as he leaves very little of the net visible. An abysmal 8 goals against on only 20 shootout attempts in 2011-12 must improve for the Jets to contend for a playoff spot in 2012-13. His game awareness and positional play is outstanding although he is occasionally prone to soft goals and does show signs of fatigue. Pavelec seems to thrive in big game situations and is in fact a potential franchise goaltender with a modest cap hit of $3.9M. 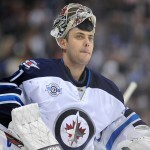 During the lockout Pavelec will return home to the Czech Republic and suit up for HC Trinec of the Kontinental Hockey League as reported via Twitter by Pavelec’s agent Allan Walsh. A resilient and inspired Al Montoya has the size and intangibles to be a top notch starting goaltender in the NHL and could get as many as 25-30 starts for the Jets in 2012-13. Hoping to finally establish himself as a big league player, the former U.S. World Junior Championship gold medalist was named the top goaltending prospect in 2005 and has unfortunately found himself behind such incumbents as Henrik Lundqvist and Ilya Bryzgalov. Having toiled in the comical goaltending situation orchestrated on Long Island the Jets believe a strong season in a hockey mad community like Winnipeg could propel the former Michigan Wolverine to finally realize his immense potential. 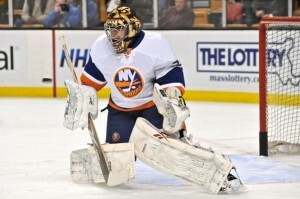 Drafted sixth overall by the New York Rangers in 2004 and with just 21 wins in 57 career starts for the NY Islanders and Phoenix Coyotes, the journeyman puck stopper from Chicago should fit in well with the team dynamic and provide consistent minutes which will give the Jets a chance to win each night. Credit GM Kevin Cheveldayoff for solidifying the goaltending situation this past summer, after losing Chris Mason as a UFA to the Nashville Predators and Pavelec threatening to play in the KHL, the team’s lack of depth at the position was well exposed. The Jets afforded 4 picks in the last 2 entry drafts on goaltenders in an attempt to add some positional depth to the organization. Look for at least 1, perhaps 2 more tenders to be claimed in the 2013 draft of which the Jets will have 6 picks in the first three rounds and 13 overall. The top goaltending prospect in the system, Eddie Pasquale, had a strong season in St John’s, leading the team to the Conference finals before falling to the eventual champion Norfolk Admirals. By establishing himself in the AHL, Pasquale looks to challenge for NHL time in the near future. It would likely serve him best to be the go to guy in St John’s for another season or two as opposed to sitting on the bench in Winnipeg. Also in the system is Connor Hellebuyck drafted in the 5th round (130th) in 2012. He will attend UMass Lowell this fall. Equipped with good size and loads of raw potential the mentally tough Commerce Michigan native will be given plenty of time to develop. The Jets finished 26thoverall for goals against with an average of 2.95 per game last season and only scored an average of 2.7. Montoya may prove to be an upgrade over Chris Mason but as the young core continues to develop offensively they will certainly need to rely heavily on Ondrej Pavelec for any level of success they hope to achieve this winter.